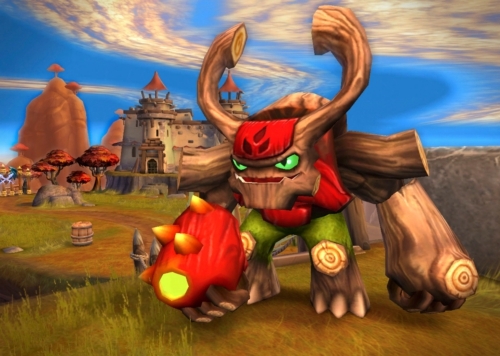 Skylanders Spyro Adventures was a break out hit in video games for 2011. They’re back and bigger than ever for 2012 with Giants! Going Big: Skylanders Giants introduces eight new highly collectible figures that are more than twice the size of the main skylanders cast in both physical and virtual form. Their in-game powers and abilities reflect their colossal scale. Bright Lights: Helping to further the real world magic of bringing toys to life, Skylanders Giants includes a set of characters that feature spectacular new light technology integrated into the toys, allowing the figure to light up when near or on the Portal of Power™. These characters have additional in-game benefits as well. Batteries are not required. Brand New Skylanders: Eight new regular sized skylanders, each with their own unique powers, abilities, and personality, join the adventure alongside the Giants. Forward Compatibility: Every beloved character from Skylanders Spyro’s Adventure is 100% compatible with Skylanders Giants, leveled-up stats and customizations intact. Wider Worlds: Portal Masters will see all new arenas and more gameplay options in Battle Mode for exciting head-to-head play, as well as enhanced Elemental Zones, new Hero Challenges, and other features that encourage players to collect and level up every character. Skylanders Giants also features closer integration with Skylanders Spyro’s UniverseTM, the large online world that allows Portal Masters around the world to greatly expand their Skylanders experience.